The Last Flight to Abuja movie crew and marketing team are still in shock by the sad news of the recent crashes of the Allied Air and Dana Air planes in Ghana and Nigeria respectively that has claimed over 160 lives. 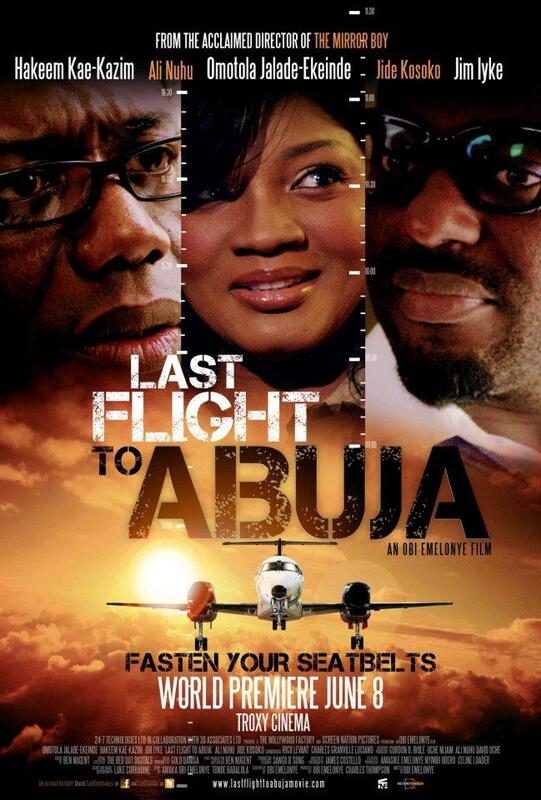 Last Flight to Abuja is a movie inspired by the several air disasters that took place in Nigeria in 2006 and with these latest crashes, the issue of air safety in Nigeria, highlighted by the film, remain very important. “Our first instinct in the light of the plane crashes was to postpone the premiere of the movie as a mark of respect to the people that have lost their lives and their families. 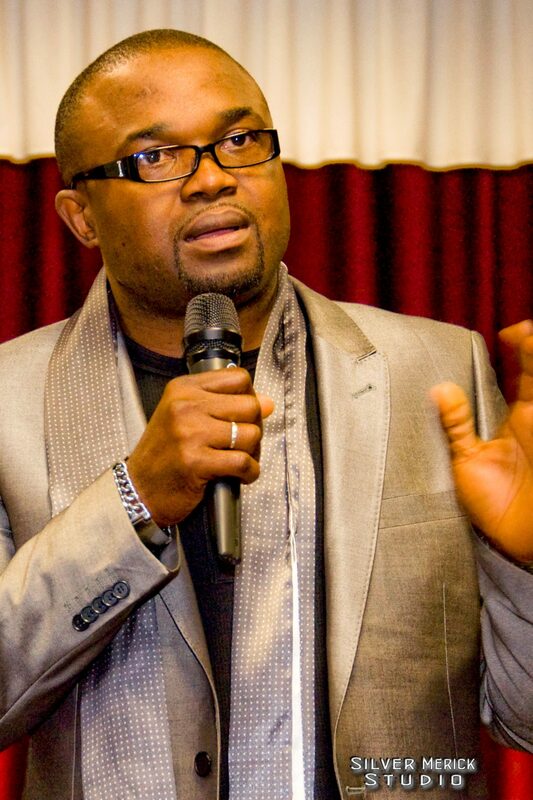 But we have carefully considered things and have decided to go on with the premiere, and for Last Flight to Abuja to be dedicated to their memory, but of more importance, we are now considering using this film as a powerful advocacy tool to highlight and influence in our own little way the issues of air safety in Nigeria and Africa at large”, said Obi. Last Flight To Abuja red carpet arrivals from 6.30pm to 8.45pm. - The evening commences at 7pm with an exclusive VIP Cocktail Reception together with presentations and interviews attended by a galaxy of top UK based African heritage film, television & music entertainment stars plus influencers from the worlds of fashion, media, sport and politics from the international cultural arenas. After various successful cinema releases in Nigeria, Ghana and Canada, Anchor Baby the debut movie by a Nigerian born/Canada based director Lonzo Nzekwe gets a theatrical released in the United Kingdom. It will be release initially in Odeon Greenwich, Lee Valley, Streatham, Surrey Quays and Manchester Printworks cinemas starting from September 2, 2011. 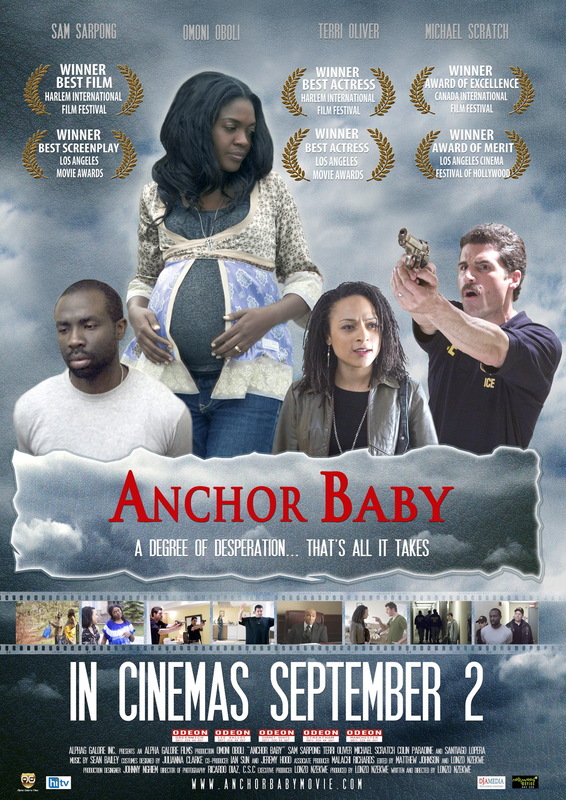 Anchor Baby is starring the award winning Nollywood actress Omoni Oboli, British born/LA based actor/supermodel Sam Sarpong and Canadian actress Terri Oliver. This will be the second time in UK history for a movie produced and directed by a Nigerian, and starring a Nollywood actor will be released theatrically in the UK cinemas. 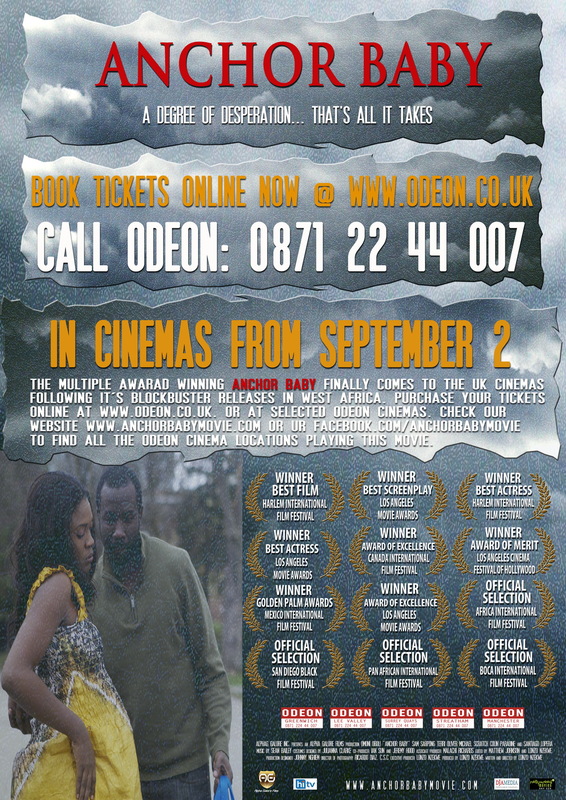 After the recent success of a Nollywood movie titled “The Mirror Boy” at the UK cinemas, Odeon cinemas in UK seem to be placing their focus on the emerging Nigeria Nollywood film industry by choosing to also release Anchor Baby in their cinemas. A spokesman from Odeon stated that the movie represents a new trend of high quality films coming out of the Nigeria film industry recently; that’s why Odeon UK feels comfortable booking it for a September 2 release. Anchor Baby is set to achieve a successful UK cinema release judging by it exceptional picture quality and great reviews from viewers and film critics around the world. This is a movie that is somewhat controversial in nature, and will keep you glued to your seat and guessing for the entire ninety-five minutes of the film. BBC “Focus On Africa” editor Leslie Goffe, wrote a two page article on the movie in their July/September 2011 edition of the magazine; calling it “a movie with consequences… with roots in Africa”. On the film festival circuit, Anchor Baby has won the “Best Film” and “Best Actress” awards at the 2010 Harlem International Film Festival. It has also won the “Best ScreenPlay” at the 2010 Los Angeles Movie Awards. Omoni Oboli who gave the performance of a lifetime also won “Best Actress” award at Los Angeles Movie Awards, adding to her win at the Harlem film festival. Anchor Baby won the “Golden Palm Award” and “Award of Excellence” at the 2010 Mexico International Film Festival and Canada International Film Festival respectively. It was also an official selection at other prestigious film festivals around the world such as Pan African International Film Festival and San Diego Black Film Festival. “A movie with a lot of heart and important social issues” is a quote from Dan Lyon; a Feature Film Unit Director for Telefilm Canada. Married, illegal immigrant couple Joyce (Omoni Oboli) and Paul Unanga (Sam Sarpong) have been ordered by the U.S. immigration to leave the country. They decide that they will leave, but only after Joyce, who is five months pregnant, delivers her baby in the U.S. This will guarantee automatic U.S. citizenship for their child. Ignoring the deportation order the couple goes into hiding. Later, Paul is caught and deported by a team of Immigration and Customs Enforcement agents. But bureaucracy keeps getting in the way of Joyce achieving her goal and just as she is about to give up hope, she meets Susan Backley (Terri Oliver), a married freelance writer who offers to help in the form of safe, free accommodation until the baby is born. With the help of her new-found friend, Joyce sets out to make the ‘American Dream’ come true for her unborn child. Anchor Baby is a movie everyone need to see; especially anyone who is an immigrant or knows one. One cannot afford to miss it.